Saying more and more savings-seeking consumers are poised to opt out of traditional phone systems, a San Mateo, California-based provider of IP communications test and measurement products today said that this slower economy gives VoIP providers a rare chance to showcase their wares. Officials at Keynote Systems say VoIP services with the best end-user experience will be positioned to take advantage of current financial pressures. Ken Harker, a senior consultant at Keynote, said the company has been conducting VoIP studies for more than three years and has seen significant trends develop, such as serious disparity in reliability and audio performance between VoIP services on managed networks and those that rely on existing broadband home network connections. “While conditions are dramatically improved for Comcast Digital Voice and Verizon VoiceWing (News - Alert) customers, the best that other consumers can hope for is merely tolerable audio quality,” Harker said. Specifically, the study compares the relative performance of AT&T landline service with six broadband VoIP providers – AT&T CallVantage, EarthLink trueVoice, Lingo, Packet8, Verizon VoiceWing and Vonage (News - Alert) – and two cable voice service providers, Time Warner Digital Phone and Comcast Digital Voice. The company, during October, collected data from calls made from residential locations in New York and San Francisco. For its study, Keynote says it analyzed the audio quality and reliability, key performance indicators that affect the end user experience across these VoIP providers, as well as traditional phone service for comparison. 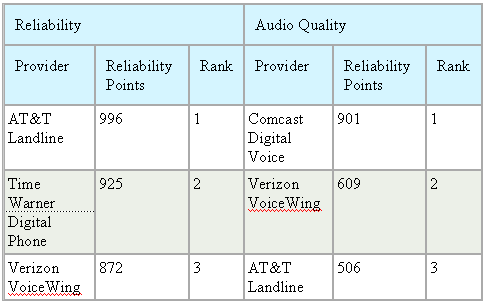 The study found that Time Warner’s (News - Alert) Digital Phone keeps its second place ranking behind landline service, and the remaining providers have generally increased their scores as compared to a preceding Wave 5 study. Keynote says that landline services continually outperform the competition when it comes to delivering great sounding call audio with minimal delay. “In Wave 6, we see digital return to the top with Comcast (News - Alert) and Verizon providing better audio quality than landline,” Keynote officials say. Other study findings include: the best providers always deliver dial tone and connect the call to the number dialed in a timely fashion; only one of the providers in the study failed to provide dial tone 99.9 percent of the time or better; all providers had very small percentages of calls with dropped audio, but only two providers had zero calls with dropped audio; and one VoIP provider required two seconds more than any other voice provider to connect calls after dialing. TMC (News - Alert) announces NGN – the new magazine for service providers building tomorrow's communications networks. Subscribe free today. Michael Dinan is a contributing editor for TMCnet, covering news in the IP communications, call center and customer relationship management industries. To read more of Michael’s articles, please visit his columnist page.